JCUA is excited to announce its newest Community Ventures Program (CVP) loan to Interfaith Housing Development Corporation (IHDC). 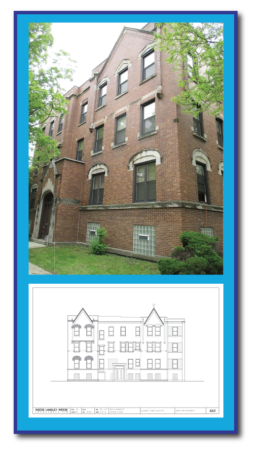 IHDC was awarded a $100,000 loan to cover a portion of the predevelopment costs for Ogden Park Apartments, a 25-unit Permanent Supportive Housing (PSH) facility in the West Englewood neighborhood of Chicago. This development involves substantial rehabilitation of the former St. Brendan’s Parish convent which closed in 1988. The site was then home to Human Resource Development Institute (HRDI) transitional housing for several years which is moving to another site in Chicago. As part of its development, IHDC will make the property fully accessible. This project complements other redevelopment projects completed on the St. Brendan’s campus. Catholic Charities repurposed the former school building into a senior apartment building (St. Brendan’s) and built new senior housing on the site of the demolished church (Hayes Manor). IHDC, in partnership with Trilogy Inc., will serve two populations that are in need of permanent supportive housing. Trilogy Inc. is a nonprofit behavioral health care organization with a 45-year history of serving persons with special needs. Nineteen of the units will be targeted to homeless individuals with a chronic disability. The remaining 6 units will be targeted to people from the State Referral Network (SRN). The SRN connects persons with disabilities and those experiencing homelessness or at risk of homelessness to affordable supportive housing options around the state. IHDC is an experienced developer that has created 17 affordable housing developments over the last 26 years including 789 units of permanent supportive housing and 75 transitional units throughout the Chicago area. All units developed contain a social service component. IHDC is also a former CVP participant. They received a $185,000 CVP predevelopment loan in 1991 to develop Ruth Shriman House, an 83-unit affordable senior housing development at 4040 N. Sheridan in Uptown. We are excited to grow our partnership with IHDC and continue to work to make an impact on affordable housing in Chicago.